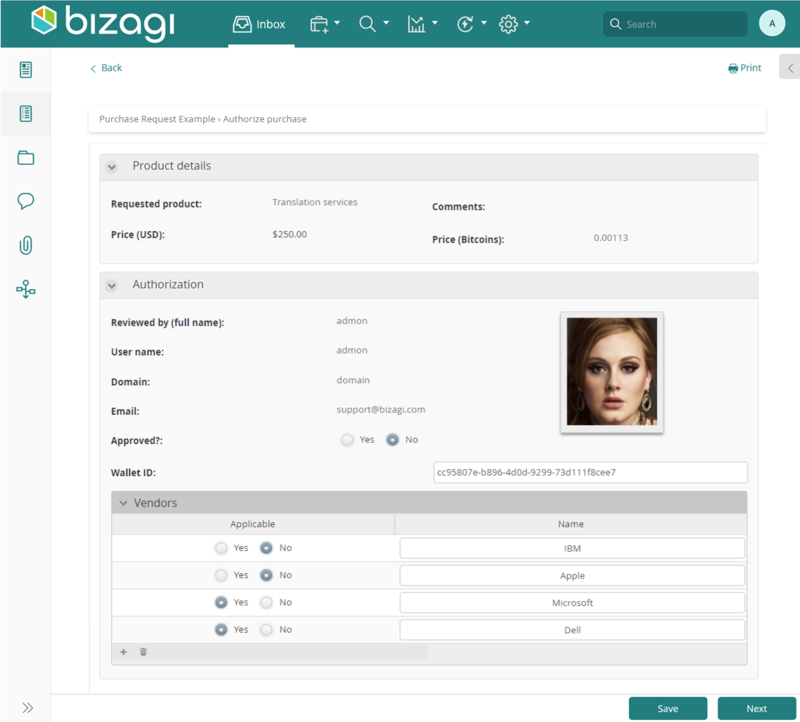 The XML Helper object is part of Bizagi's business rules API, and it provides data access for your processes when working with XML-structured information, as described at XML Helper object. This section illustrates an example on how to use one of the methods featured by this object, the saveCaseAsString method, which is oriented to inserting or updating information for any given case, while relying on what is stored in its scope. In the following sample process, assume we have a process called SimplePurchaseRequest. 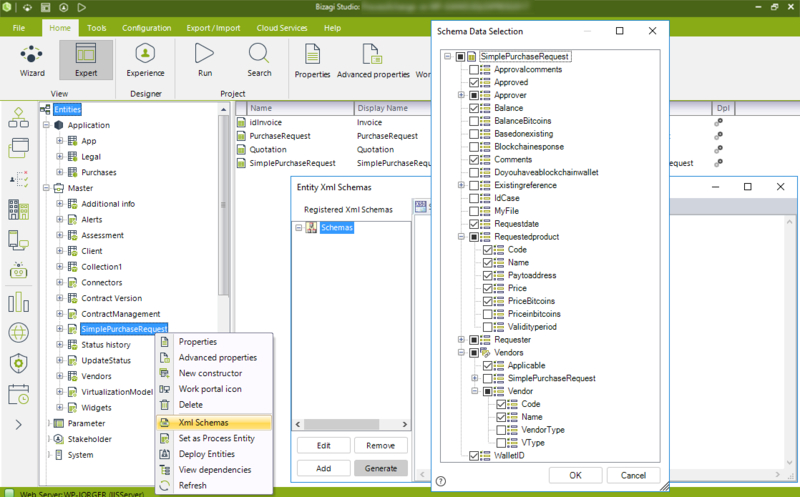 To do this, it you should first look up the definition of the expected XML structure of your entity, by relying on the schema definitions created in Bizagi Studio. Note that you will need to make sure you use an schema for the process entity of the process to which you have an instance's case ID. For more information about predefining schemas, refer to Bizagi's data model XML schemas. 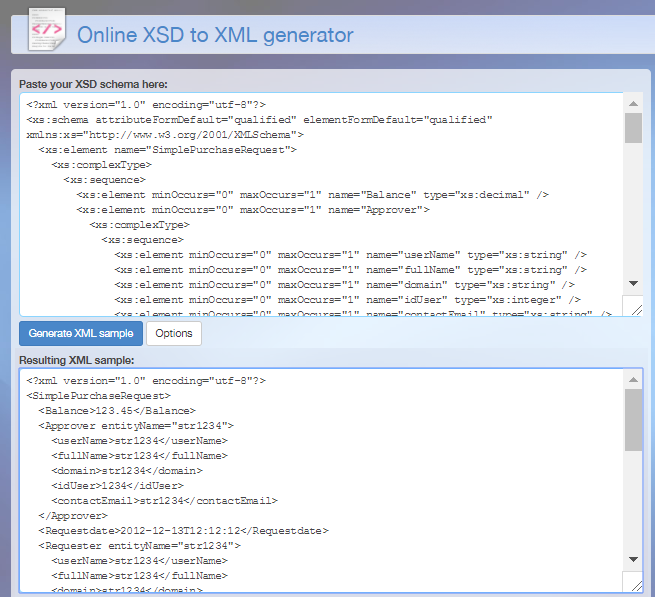 You may rely on the XSD schema definition to generate an XML having the information while ensuring it is compliant, by relying on many available free services in the internet such as http://xsd2xml.com/. 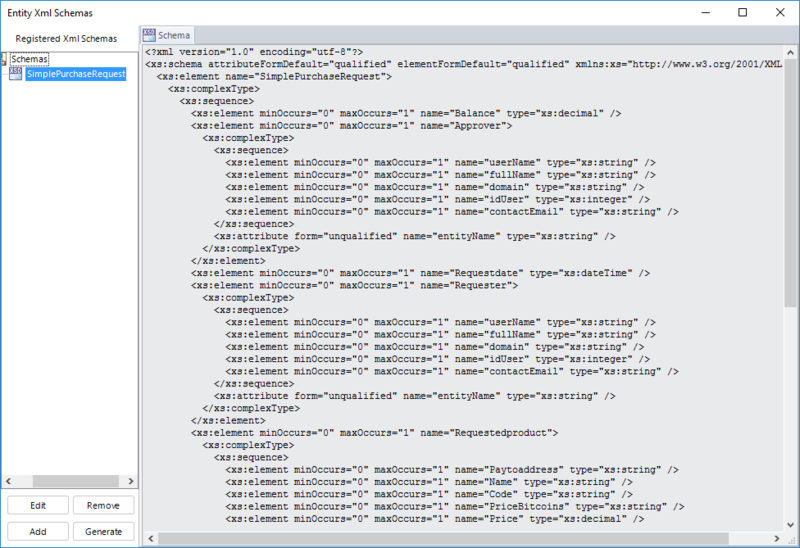 However, consider that this is just a portion of what you need to send inside of the XML-structured string. 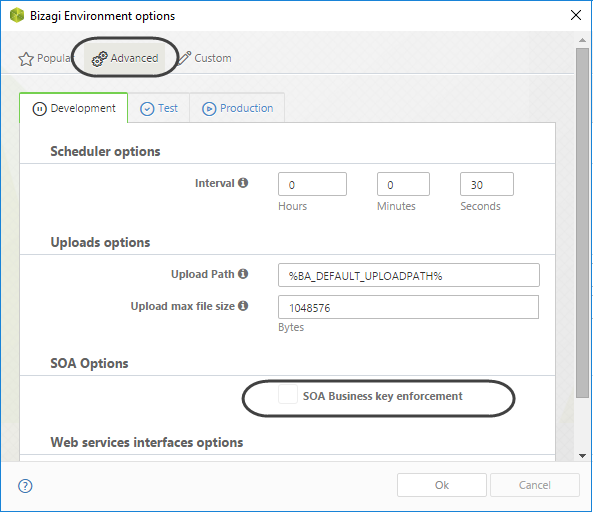 This will make sure that you send out an input which complies to the same one used for the saveEntitiesAsString SOAP web method (when using Bizagi's web services API). For more information about this expected structure and filtering options, refer to Save Entities. Note that if you will be assigning information to the case, which are existing records, then you may rely on the definitions of business keys of the particular entities involved in order to avoid creating new records during the invocation. 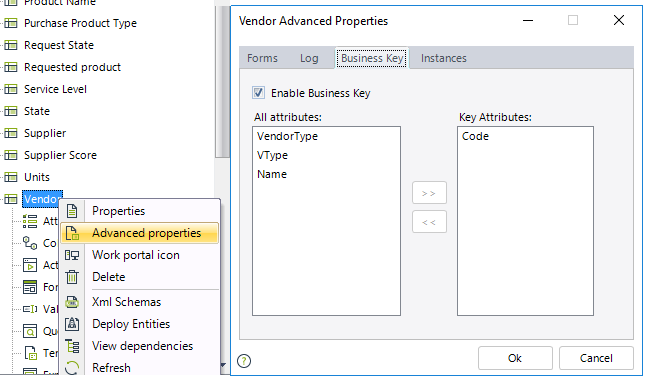 For more information on how to reuse your existing business key definitions, refer to Using business keys in XMLs. If this checkbox is unmarked we strongly suggest the input parameter businessKey be set to false. Now in order to save XML-compliant information into a given case, you may rely on the CEntityXmlHelper.saveCaseAsString method. Notice that because records in Vendor already exist (having information in the Code attribute using: V001, V002, V003 and V004 values as business keys), then such records will not be created but referenced for this case. Though the CEntityXmlHelper.saveCaseAsString method does not return a response, updated information will be reflected immediately on the applicable current activity handling the scope (you may verify this by working on the processes via the Work portal). Notice in the example above, that CHelper.trace is being used as well (optionally), given that it will allow you to print out custom traces of values and responses in the execution of the rules. For more information about the use of this tracing option, refer to Validating business rules.